With God’s guidance and your support, John Knox Christian School will be honouring our past, enhancing quality Christian education, and building for the future. The renovation project is driven by a vision that should unite our Christian community and reflects much forethought. Its express purpose is to improve the quality of education and to create a school that will serve future generations very well. As our school is blessed with growth, we have an opportunity to renew our vision and focus on strengthening the distinct qualities of the education we offer. A Christian foundation serves as the solid basis for curriculum, for teaching / learning activities, and for staff / student relationships. Our goal is that students may thrive in their various pursuits and offer valuable service to their communities. It is easy to focus on the cost, but the needs will remain. Doing nothing or very little also comes at a high cost. 75% of the funds have been offered and we continue to seek community contributions to reach our campaign goal of $3.2 million. Please prayerfully consider ways in which you can lend your support and join us on our journey to improve and enhance what we are called to do: instruct, inspire and educate. We’re adding to our building! This gives us a chance to alter the flow and create a new focal point for the school. It will provide the students more room and space for what they need. The renovations will include upgrading the KinderStart room to provide more room for their tables and chairs so they can spread out. There will be two bathrooms, one for boys, one for girls. This new room would also have a separate coat room. The Kinderstart students will have their own door to the playground so they’ll no longer have to share with those big grade eight kids. 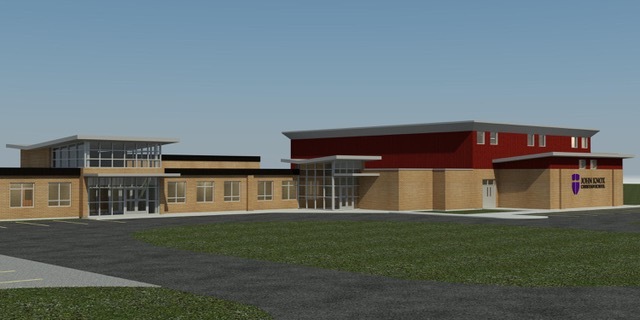 The current gymnasium will be renovated to yield space for resource, Barton Program, project rooms, and a learning centre which will house the library and computer area. A better designed Resource area underlines our commitment to helping students while the project rooms serve a variety of purposes, including organized group work and student and teacher conferences. A new multipurpose auditorium will be created. This will offer a better opportunity for students to play sports, while providing the potential to attract recreational sports groups throughout the community. In addition, this space can be used as a multi-purpose auditorium, offering uses for dinners, concerts, and celebrations. With a built-in stage, it provides support for student drama and musical performances. We have started this fundraiser to help raise funds. It's just one small part of our $3.2 million dollar renovation cost, but it's so close to our heart. We want to offer the best to our young students. After all, this is where kids begin their learning journey. Help give our kids a great start!